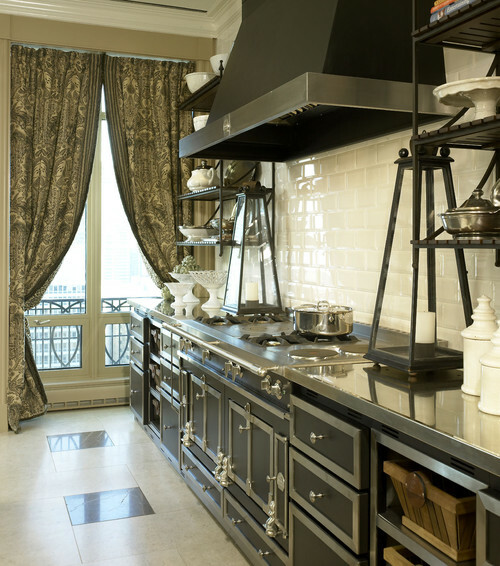 La Cornue is a French oven and cooking range manufacturer. 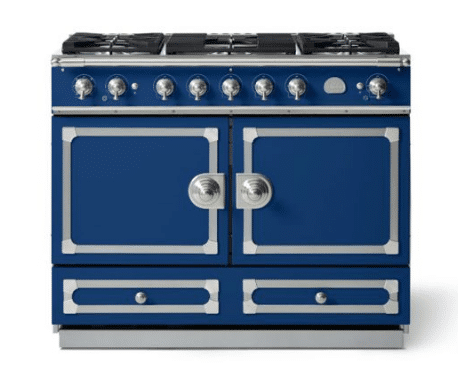 It all started with their founder, Albert Dupuy, wanting to create an oven that used a new type of natural gas, being used in Paris at the time, back in 1908. La Cornue is now owned by Middleby, a US based commercial manufacturer and also owner of Viking. Their ovens feature a concave interior which allows the oven to naturally convect, and result in superior even heat distribution and ultimately better cooking results. Natural convection does not dry food like traditional air driven convection. Let's look at their more traditional series, the CornuFe. 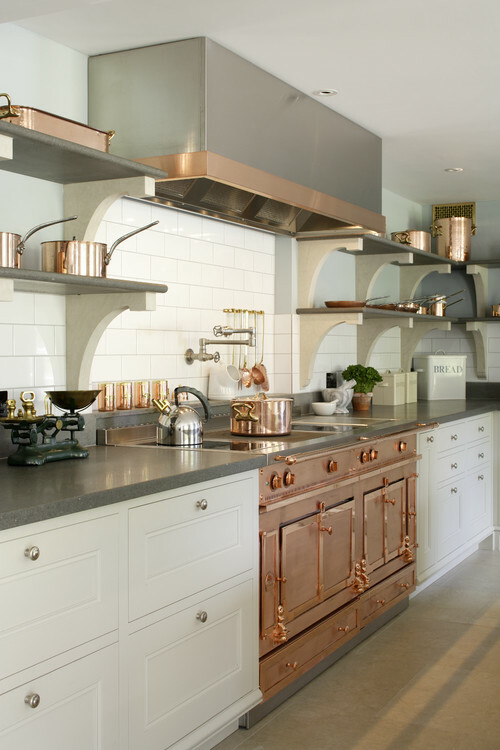 The CornuFe is designed with the American kitchen in mind. They are dual fuel, featuring robust brass gas burners on top and an electric convection oven below. There are two sizes. The CornuFe 110 is 43 inches, which is a bit baffling. It does not fit any standard American cabinet sizes. It features two ovens below with 5 burners on the top. 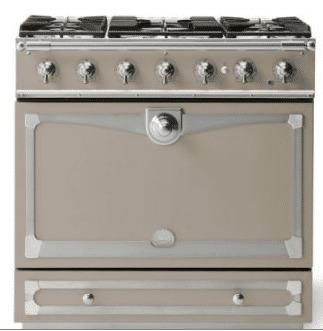 The CornuFe 90 is American sized at 36 inch with one oven and the 5 burners on the top. You have a choice of 9 designer finishes with a minimal lead time. Prices start at about $9,500 dollars for this series. The Custom Series Château ranges are built to order and made in France. Each unit is individually hand-made and customized based on your requests and specifications. 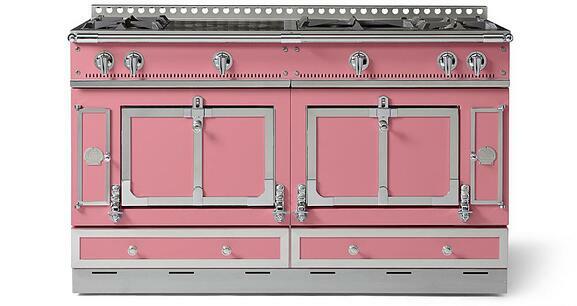 These ovens are truly customized, so anything can be requested, including custom heights, or colors. You are even assigned a project manager for your range. Here are a few options...each has a purpose depending on how you cook. Lava-Rock Grill: Linear gas burner running front to back set beneath a bed of natural lava rocks and topped with an enamel coated open style grill; considered 14,500 BTU. The lava rocks will evenly disperse the flame. Power Burner: One oversized brass burner set inside an enameled drip tray with an enamel coated cast iron grate. Great for sautéing or stir fry and wok cooking. 22,000 BTU Burner. Plaque “French Top”: One gas burner installed beneath a solid cast iron top, serving as the heat source for the entire cast iron surface. The cast iron plaque becomes the cooking center and offers variable heat zones with the strongest heat in the center, directly above the burner, and diffusing outwards. This allows for multiple sauce pans above a single indirect heat source. Available in Large, Petite & Black Enameled. Two Electric Burners: Two solid cast iron electric burners set inside a stainless steel surrounding. This is ideal for controlled heat and more delicate dishes, like eggs or crepes; 2,000 watts each. Two Induction Burners: On any cooking surface that has the option for electric, you can substitute for induction. This configuration is quite unique, being able to offer and create a surface with both gas and induction elements on one cooking surface. You may actually like induction better. Other brands are going to offer either an all gas top or all electric top. 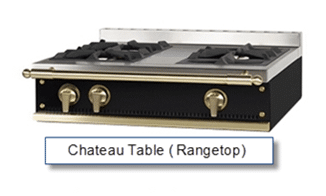 If you didn’t want the full range, the Chateau units are also available as a “Rangetop”, so you’d be able to just order the top with the same configuration, color and trim options. New in 2016 "The Suzanne Kasler Couleur Collection"
Suzanne Kasler is an American designer. On a visit to her favorite ribbon shop in Paris at Entree des Fournisseurs, she was inspired and a new partnership was created with La Cornue to create a beautiful new color palette for the brand. The collection is organic and earthy, yet bold.  The idea is to bring a new design relevance, to something that is already classically French. This collection includes 10 new pastel palette colors that were created to transform an icon into something even more iconic. 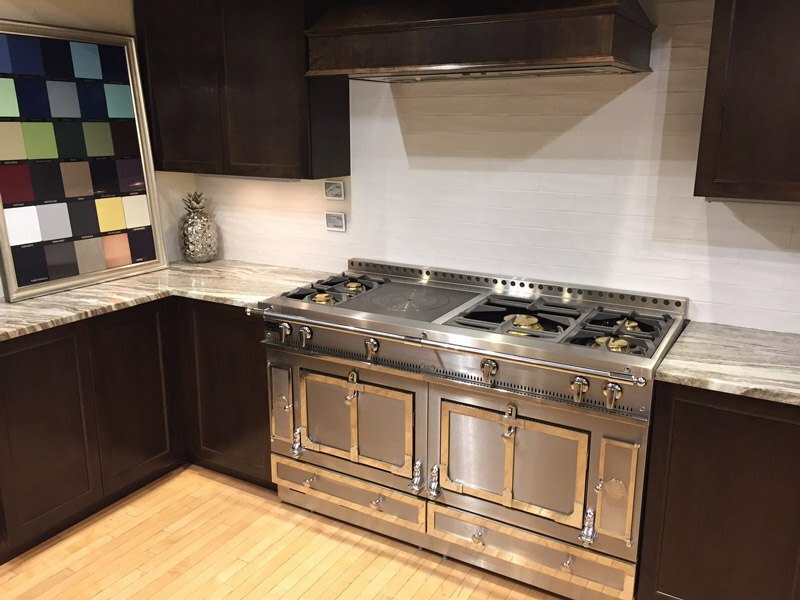 La Cornue will also offer a variety of accessories to compliment their line of ranges, as well as a line of custom hoods and custom cabinetry. 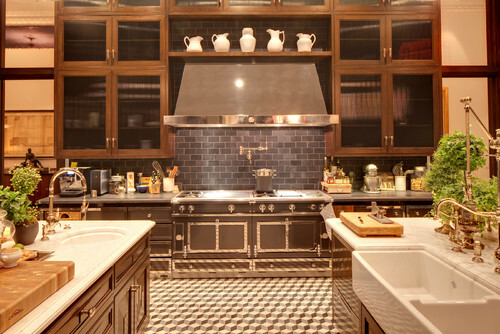 All cabinetry, hoods and Chateau lines are custom made to order and have a wide variety of options. The ordering lead time for these is currently 16-22 weeks except in August when the factory and France is closed. There are many reasons to buy a La Cornue range. First, it looks different than a normal stainless steel range. The natural convection oven performs better than a fan driven system. The Chateau is the world's best range with endless options designed on how you actually cook. From a showpiece to an actual workhorse, the Chateau is the finest range made. Want to learn more about Kitchen Appliances? Get our Pro Cooking Buying Guidewith features, specs, BTU outputs of every pro range as well as detailed profiles of every brand. Well over 185,000 people have read a Yale Guide.